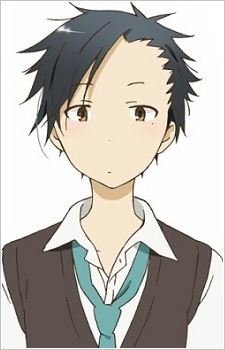 Hajime is a transfer student during the second semester who is Kaori's primary school classmate. He and Kaori promised to meet in the park the day before he transferred to Hokkaido, to which Kaori never fulfilled due to her accident. His family has strict demands on him, to the point where he isn't allowed to buy games. Hajime is first shown as a very friendly person the day he transfers into his new school, however he rather acts very cold and distant towards Kaori. He calls her a "traitor" every single time due to the unfulfilled promise Kaori had on him, yet he doesn't tell her the truth until much more later.